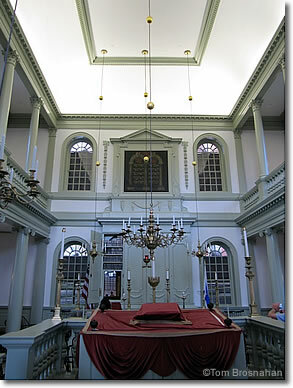 Touro Synagogue is Newport's most famous early house of worship and an architectural treasure. It's been beautifully restored. Touro Synagogue, the handsome Federal building a half block up Touro Street from Washington Square (map), is a National Historic Site, named for a 19th-century benefactor, Abraham Touro, son of the rabbi who presided at the synagogue's dedication. Designed by Peter Harrison (it resembles his King's Chapel in Boston) and built in 1763, the temple was the spiritual center of Jeshuat Israel, an Orthodox Sephardic congregation in Newport, a colony known for its tolerance and freedom of religion. It is the oldest synagogue building still standing in the United States, having celebrated the 250th year of its dedication in 2013. But in fact, Jewish life in Newport is even older, beginning with the arrival of the first Spanish and Portuguese Jewish immigrants in 1658. By 1677 they had purchased land for the synagogue, but construction would have to wait for several decades. 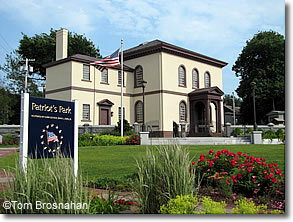 The synagogue and congregation prospered along with Newport, but after the British occupation of the town during the Revolutionary War, prosperity fled Newport and few of its erstwhile citizens returned. In the late 19th century Newport came to life again. The temple reopened in 1883, and has been used for services ever since. Extensive and painstaking renovation work was carried out in 2005-2006, and the synagogue is now more appealing than ever. 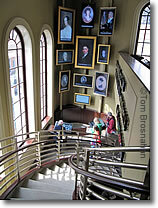 Exhibits in the new (2009) Ambassador John L Loeb Jr Visitors Center next door tell the story of the synagogue in the context of Newport's history of religious tolerance and equality. You can see a copy of George Washington's historic letter on religious freedom to the congregation, written while he was president in 1790, on the occasion of his visit to Newport with Thomas Jefferson. The colonial Jewish cemetery here is one of the keys to the synagogue's history, and has figured in American literature, particularly in poems by Henry Wadsworth Longfellow and Emma Lazarus.